Everyone has been told to brush their teeth at some point in time. Chances are pretty good you brush your teeth; and you probably think you are doing a good job. However, are you really brushing your teeth the right way? The unfortunate truth is there is a good chance you aren’t. Choosing the right tooth brush: Choosing a stiff bristle tooth brush can hurt your teeth and cause more damage to your gums. So, pay attention to what you are brushing your teeth with. Steer clear of those stiff bristles because they are just causing more damage than good. They are not getting your teeth cleaner just because they are stiff. 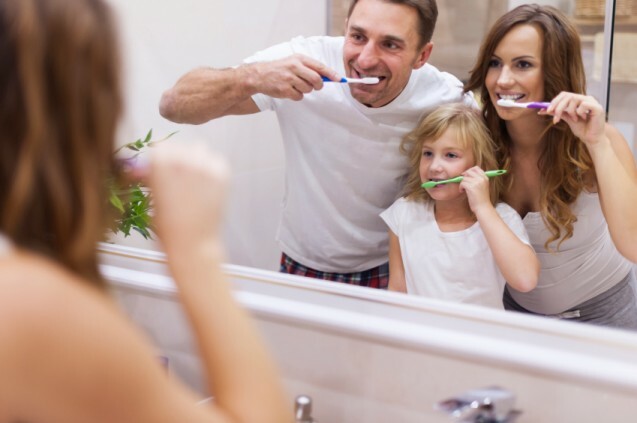 The Magic of 3: A lot of people brush their teeth in the morning and before they go to bed. While that is a great routine, do you really only eat two times a day? You should consider brushing your teeth a third time somewhere in the middle of the day. It is actually great to brush your teeth after every meal and once right before you go to sleep. Technique: If you’re doing wide, side-to-side strokes you are scraping your gum line. You should hold your brush at a 45-degree angle to your teeth and gums and then brush up and down, in short strokes. Replace Your Toothbrush: Most people don’t know this but you should be changing your brush every 3 to 4 months. This sounds easy enough, right? Of course! Brushing your teeth is not supposed to be hard. In time, it is going to be a task you give little thought to. Just make sure you remember to have a good technique and change out that toothbrush from time to time.